The Barbican Centre (as part of the City of London Corporation) and the Barbican Centre Trust Ltd ("we", "us" and "our") are committed to upholding your privacy and taking care of the personal information that you may volunteer as part of ticket bookings, online purchases, membership or donation forms, e-newsletters or event sign-ups and visitor surveys. This policy deals with how both the Barbican Centre and the Barbican Centre Trust collect and share information about you. This policy seeks to clarify those activities for which the Barbican Centre will be responsible for the use of your personal information, and those activities for which the Barbican Centre Trust will be responsible. You can find out more about both the Barbican Centre and the Barbican Centre Trust by contacting us using the information in the contact us section. We may amend this notice from time to time to keep it up to date with legal requirements and the way we operate. Please regularly check this page for the latest version of this notice. The following information applies to the Barbican Centre’s and Barbican Centre Trust’s use of your personal information. Where one organisation is solely responsible, we will make that clear in this policy. We will ask for personal information when you register, sign up to a mailing list, make a booking, join as a member, make an enquiry, register for a learning activity, or order products and services from us. We will also ask for personal information when you make a donation, enquire about a giving programme, purchase fundraising event tickets, sign up to receive supporter updates through the Barbican Centre’s box office or the Development Department. We will retain information such as your name, contact details and contact preferences when you make a purchase from our box office, make a donation or otherwise buy products from us. For donations, we keep a record of the details of the gift (amount, date, purpose) and your Gift Aid status. The Barbican Centre Trust may ask you to provide details about your current interests and activities, and the details of your family and spouse/partner where appropriate. For all transactions, we keep a record of your bank or credit card details used to make the purchase, but only temporarily and solely to process your transaction. If you are a corporate subscriber or Foundation Administrator, we may ask about the organisation for whom you work/with which you are affiliated. As part of your participation in some of our programmes, we may use your data differently than is set out in this policy. We will provide you with any additional information about how we will use your personal information when you join these programmes. 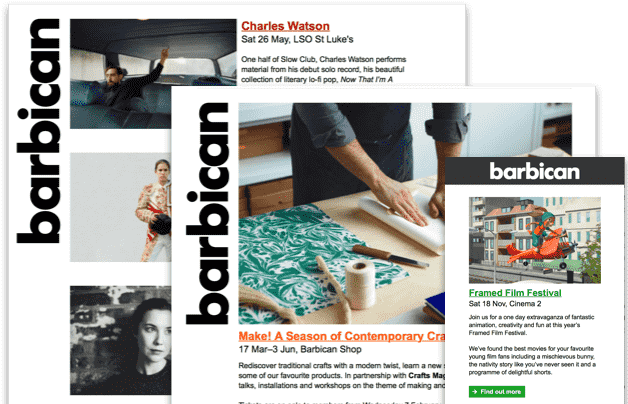 Depending on your preferences, the Barbican Centre will contact you to let you know about upcoming events, offers from our shop and restaurants, updates on our plans and progress we are making, and to ask you to join as a member. Additionally, the Barbican Centre Trust will contact you about the impact of your gift, upcoming events, updates on our plans and progress, and to ask you to make a donation or consider other types of support. Occasionally, the Trust may include information about other supporters or sponsors in these communications. We make it easy for you to tell us how you want to receive communications in a way that suits you. We always use clear marketing preference questions and we include information on how to opt out when we send you marketing. If you don’t want to hear from us, that’s fine. Just let us know when you provide us with your information or change your preferences at any time by changing the relevant settings in the My Account section of our website or contacting tickets@barbican.org.uk. We use various techniques including market research and audience profiling to help us understand our audiences, customers, members, donors and potential supporters. We do this because it allows us to send appropriate communications and make appropriate requests to those who may be able and interested in attending or giving more than they already do. For similar reasons, we may hire the services of a third party company in order to enrich the data we have collected from you with information from publicly available sources. This may include, for example, information about education, professional activities, geographic and demographic information, interests, preferences, charitable interests, activities and capacity to support the Barbican Centre Trust, a registered charity and, where not otherwise available, the information listed in the ‘What personal information do we collect and process’ section above. We do comprehensive checks on any third parties we work with; additional information on this is stated under the 'Who we might share your personal information with' section below. Your personal information might be passed to a third party if they need it to fulfil your order(s) for our goods and services, to execute the communications we send to you, to conduct market research and audience profiling outlined above, to process a donation, or where you have otherwise consented to being contacted by selected third parties, such as artistic partners and associates. We do comprehensive checks on these companies before we work with them, and put a contract in place that sets out our expectations and requirements, especially regarding how they manage the personal information they have collected or have access to. Examples of these third parties include our bank (in order to process Direct Debit and other payments), mailing houses (for distributing our events guides), our bulk email distribution service provider, and audience analyses and data cleansing suppliers, for example to access the Post Office National Change of Address (NCOA) database. Except as set out in this policy, we shall not disclose your personal information unless obliged to, or allowed to do so by law, or where we need to in order to run our business (e.g. where other people process information for us). In such circumstances, we ask those people to give us confidentiality, non-disclosure or other relevant compliance undertakings. We will not share your information other than as described in this policy without your express consent. Where we are working with you individually, or over a sustained period of time, for example in one of our Creative Learning projects, we may need to collect additional information from you including, for example, socio-demographic information, medical details, educational attainment, details of prior artistic experience and details of any learning difficulties or special access requirement. This information will be used by our project team in order to plan and deliver the very best artistic and educational experiences for you, to keep participants safe throughout their experience with us, and may be passed to emergency services for use should any emergency situation arise. This data will also be used to monitor and evaluate our projects for report to external funders and government bodies. Where projects are run with the Guildhall School, your data may be shared with the Guildhall School whose privacy notices can be found at gsmd.ac.uk/privacy. The Guildhall School and the Barbican share the same data controller, the City of London. We will always seek your consent for the above at the time we collect your information, and, where we need to collect this information in respect of children or young people, we will ask parents or guardians to provide the information and consent to its use for the purposes described. If you are under 18, we will ask you to confirm that you have your parent/guardian’s permission to provide with this personal data and, where applicable, to engage in a contractual relationship with the Guildhall School. If you are under 13, you should not provide us with personal data and should ask your parent/guardian to complete any forms on your behalf. Many of the events at the Barbican are presented in partnership with other organisations such as the London Symphony Orchestra, our Resident Orchestra, and the Guildhall School of Music and Drama. When you provide us with information in relation to an event that you are attending, we may ask you about your access requirements and dietary preferences. Some of the information which we collect from you may constitute sensitive personal data. We will only ever use this in accordance with this policy and shall maintain necessary measures to protect this information and its confidentiality. Whenever we ask you to provide your personal information, we will let you know why we are asking, and how we will use your information, by directing you towards this notice. We ensure that there are appropriate technical controls in place to protect your personal information; for example, any information which we transfer is encrypted and password protected, and all of our staff receive data protection and security training. The personal information that you provide will be held securely and will not be used for any other purpose than as provided for in this policy. Some of our suppliers run their operations outside the European Economic Area (EEA). Although they may not be subject to the same data protection laws as companies based in the UK, we will take steps to make sure they provide an adequate level of protection in accordance with UK data protection law. To this end, we obtain contractual commitments from them to protect your personal information. Some of these assurances are well recognized certification schemes like the EU - US Privacy Shield for the protection of personal information transferred from within the EU to the United States. We will store your personal information for as long as is reasonably necessary for the purposes for which it was collected, as explained in this notice. In some circumstances we may store your personal information for longer periods of time, for instance where we are required to do so in accordance with legal, regulatory, tax, accounting requirements, such as our requirements to report on the sources of our funding and donations received. We may also store information as a requirement to report on audience activities and expenditure to one or more of our funders. We endeavour to keep your personal information accurate and up to date. If you become aware of errors or inaccuracies, please email tickets@barbican.org.uk or update the information we hold about you by using the ["My Account" section of our website]. Where possible, we use publicly available sources to keep your records up to date; for example, the Post Office National Change of Address (NCOA) database and information provided to us by other organisations as described in this policy. Subject to certain exemptions, and in some cases dependent upon the processing activity we are undertaking, you have certain rights in relation to your personal information. We may ask you for additional information to confirm your identity and for security purposes, before disclosing the personal information requested to you. We reserve the right to charge a fee where permitted by law, for instance if your request is manifestly unfounded or excessive. You can exercise your rights by contacting us using the contact details below. Subject to legal and other permissible considerations, we will make every reasonable effort to honour your request promptly or inform you if we require further information in order to fulfil your request. The Information Commissioner is the UK's independent authority set up to uphold information rights and data privacy for individuals. You have the right to lodge a complaint with the Information Commissioner if you are dissatisfied with any aspect of the way that we collect and use your personal information. The Information Commissioner's website can be found at www.ico.org.uk or you can call their helpline on 0303 123 1113. Depending on which of us is using your personal information in accordance with the above, either the Barbican Centre or the Barbican Centre Trust will be 'data controller' in relation to your personal information, i.e. either of us will determine the purposes for which your personal information is processed, and how that information is processed. If you would like any further information about our approach to data protection and privacy, or to request details about the information we hold, or exercise any of the rights listed above, please contact us by email at tickets@barbican.org.uk. The City of London has appointed a Data Protection Officer, who can be contacted by email at information.officer@cityoflondon.gov.uk. If you have any questions at all about the ways in which we collect and use your personal information please contact us at tickets@barbican.org.uk at any time. The Barbican Centre takes the security of your personal information seriously. Our systems are regularly penetration tested and audited and all sensitive data is encrypted. None of the personal information, including credit card details are stored on our server infrastructure.